The Cloverhurst House kitchen features two different cabinet styles. For the island our clients chose rift sawn oak, inset cabinets finished with an espresso stain and silver glaze, with satin nickel hardware, and for the perimeter European Style cabinets finshed in Benjamin Moore's China White. The kitchen hood was hidden with sheetrock, and we integrated floating shelves into the band of the hood. The client wanted open drawers underneath the cooktop so we painted the interior of those black to minimize their apperance. These kitchen cabinets were custom designed to hold all of the clients applicances. The master bath features floating vanities with removable pallets underneath, and a beam appliance garage. The vanities were designed to allow the countertop to continue into the tower.. This custom file cabinets features metal feet and overhead lighting. It also has a mate that mirrors it. This kitchen also features a custom china cabinet with glass doors and a TV display. 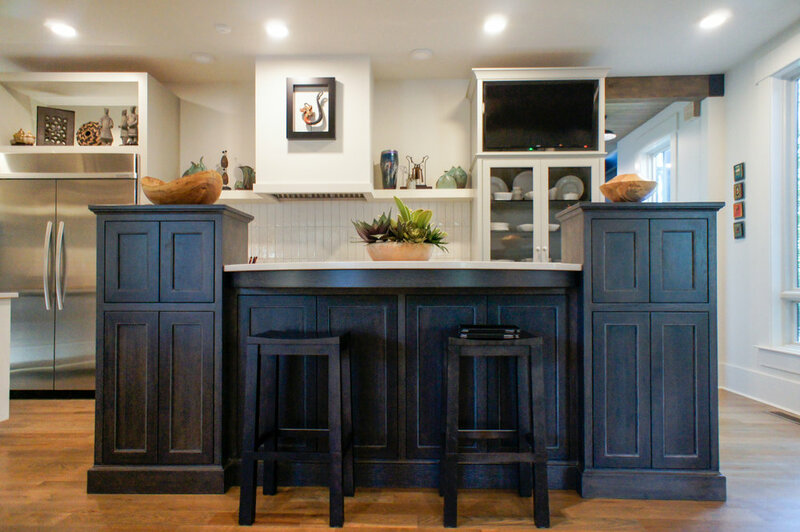 This kitchen island features a farmhouse sink and raised bar. This mud room features full overlay cabinets with custom dividers to hold the clients metal baskets. This master bath tower features a custom cut slated vent and push latch doors.